Funeral services for J. 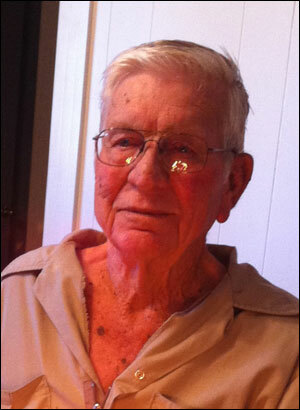 B. Barrett, 86, of Bovina, were held Thursday, April 4, 2013, at First Baptist Church in Farwell, Texas with Rev. Russ Ponder of Farwell and Corey Speer of Odessa officiating. Burial followed in the Bovina Cemetery under the direction of Ellis Funeral Home of Muleshoe, Texas. Mr. Barrett died Tuesday, April 2, 2013 in Clovis. He was born October 4, 1926 to Elmer O. and Ruby Hawkins Barrett in Roscoe, Texas. He married Mable Sue George in Flomot, Texas on October 2, 1952. He had lived in Bovina since 1954 having moved from Lockney, Texas. Mr. Barrett was a member of the Calvary Baptist Church in Friona. He had been a deacon in the First Baptist Church of Bovina for thirty plus years. He enjoyed playing dominoes and loved to fish. He served his country during World War II in the Merchant Marines. He was preceded in death by his parents. Survivors include his wife Sue Barrett of the home; one son, Jay Be Barrett and wife Jana of Farwell, Texas; one daughter, Jana Headrick of Lubbock; two brothers, Monty Barrett of Lubbock and Robert Barrett of Fort Worth; six grandchildren, Joel Barrett, Jordan Barrett, Britton Barrett, Christian Barrett, Catherine Speer, and Cheryl Millican; and five great-grandchildren, Emmaleigh Neil, Ruth Millican, Isaiah Speer, and Brooklyn Barrett.